I don’t drink breakfast tea, or ‘builders tea’ as it is known over here, simply because I prefer the wonderfully perfumed blend of bergamot and black tea that is Earl Grey. I’ve been through many Earl Grey teas in my time in the vain hope of finding the blend that showcases the right balance of bergamot and black tea. Luckily for me I seem to have settled on Twinings’ The Earl Grey. The Earl Grey is the revamped blend of Twinings Earl Grey, which, despite being the first Earl Grey, was quite weak on the bergamot for my tastes. The Earl Grey is much stronger on the bergamot and makes for a rather sweet, citrus-laden blend that strikes a wonderful balance between light and dark. How The Candy Perfume Boy Drinks It: Milk and 2 sugars after brewing for 2 to 3 minutes. 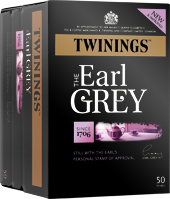 Twinings The Earl Grey is available in a variety of sizes and in tea bags or loose leaf. A box of 50 tea bags costs £2.60 and can be purchased from Twinings and most supermarkets. Blossom Earl Grey was initially released as part of a limited edition series of floral teas and is by far my favourite. For this blossom tea, the clean yet wonderfully dirty note of orange blossom is paired with Twinings’ signature Earl Grey. I love my florals and this tea really conveys the bright, sunny nature of orange blossom in a truly delicious way. It’s also feels very clean but has a light him of that weird mothball-like indole that gives the flower its identity. I would go as far as rating this as one of my favourite teas, it is everything a good tea should be; delicious, floral and utterly calming. 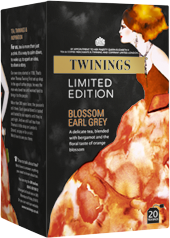 Blossom Earl Grey is available in a box of 20 tea envelopes for £2.09. It can be purchased from Twinings and from most supermarkets. Lavender Earl Grey was released alongside another floral tea, namely Jasmine Earl Grey, a tea which failed to move me, and more importantly, my taste buds! Lavender Earl Grey however moved me, BOY did it move me! Those who have read The Candy Perfume Boy’s Guide to Lavender will know of my recent lavender-epiphany that sent me on a voyage of herbal-floral discover that once started, could not be stopped. 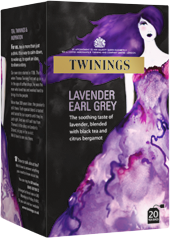 Lavender Earl Grey came along at roughly the same time, or the right time as some would say. It is a blend of strong, black Earl Grey with the delicious burned caramel, menthol and herbal facets of lavender. Perfumed beauty! Lavender Earl Grey is available in a box of 20 tea envelopes for £2.30. It can be purchased from Twinings and most supermarkets. This is my most recent tea obsession! Teapigs are a relatively new tea brand who follow the philosophy of “no airs. no graces. just fine tea.”  They offer a wide selection of different teas from black to white as well as herbal teas and matcha, some of which are contained within lovely tea temples. Liqourice and Peppermint is my absolute favourite Teapig. It is a really clarifying and refreshing mint tea with the weirdest aftertaste of feet liquorice. The first time the mint unexpectedly turned from a green, herbal taste to warm, sweet liquorice in my mouth, I couldn’t help but smile and I’ve been smiling ever since. How The Candy Perfume Boy Drinks It: As it is after brewing for 2 to 3 minutes. 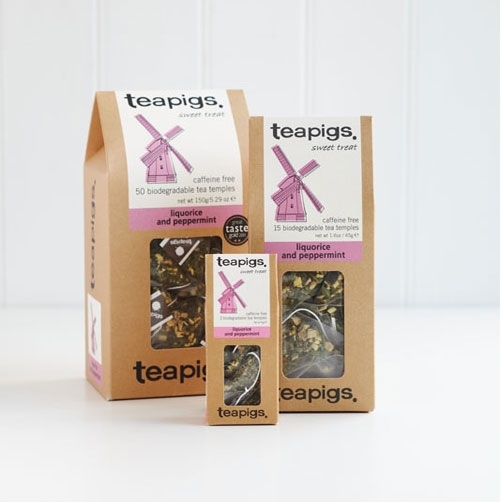 Liquorice and Peppermint is available from Teapigs and Waitrose. 15 Tea Temples cost £4.49. 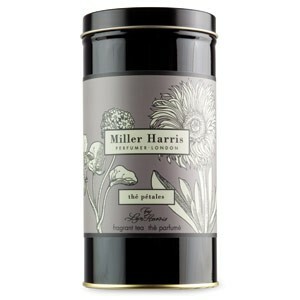 I was introduced to the delight that is Miller Harris’ Thé Pétales on a visit to their tea room/shop for a Basenotes event a good few years ago. Miller Harris describe it as “an exceptionally pure blend of Vanilla Ceylon tea and Rose Absolute from Turkey. With a heart of Taiwanese White Tip Oolong, Geranium Bourbon and Vanilla Bourbon from Madagascar” . Thé Pétales is what I would call a ‘pretty tea’, it is very light and its accents of rose, geranium and vanilla are all tiny little nuances that blend seamlessly into a beautifully luxurious tea. This one is much more refined than most rose teas and for that reason it is reserved for special occasions only. How The Candy Perfume Boy Drinks It: As it is after brewing for 3 to 4 minutes. Thé Pétales is available in a 50g caddy (loose leaf) for £16. It can be purchased from Miller Harris. Chai, due to its spicy and warm nature, is usually reserved for winter, because frankly there is nothing better than cuddling up with its warm spice when the weather is cruel and unrelenting. 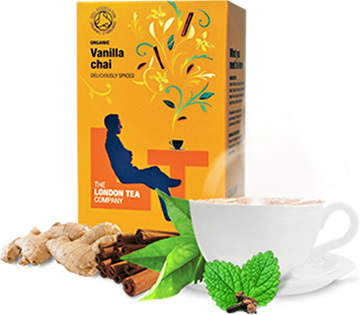 The London Tea Company’s Vanilla Chai takes this comforting tea to the next level by amping up the vanilla to give this tea the most delicious, sweet and creamy texture. How The Candy Perfume Boy Drinks It: Milk and 2 sugars after brewing for 3 minutes. Vanilla Chai is available from The London Tea Company in a box of 20 tea envelopes for £2.15 (pyramid bags are also available). I realise that I am a shameless cheat with this one, and I’m sure that many of you are reading this thinking; “hold on a cotton-picking minute, that’s not tea” and you would be right, it absolutely isn’t! But in my defence this hot chocolate is one of my favourite things to drink in the winter months. 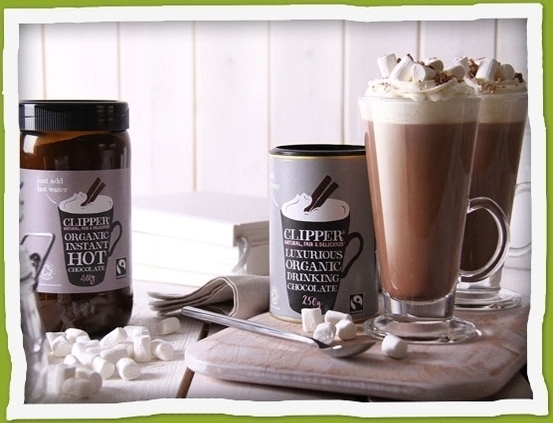 Clipper Fairtrade Organic Instant Hot Chocolate is available in a variety of sizes. A 400g jar costs £3.59 and can be purchased from Clipper and most supermarkets. What tea(s) do you like to drink? Have you tried any of my favourite teas? Please leave your comments in the box below! All links are for information purposes only. I am not affiliated. Posted in Article, Tea and tagged Article, Chai, Clipper, Earl Grey, Floral Tea, Hot Chocolate, Miller Harris, Rose Tea, Tea, Teapigs, The London Tea Company, Twinings. Bookmark the permalink. It seems like many perfumistas are tea lovers, too! 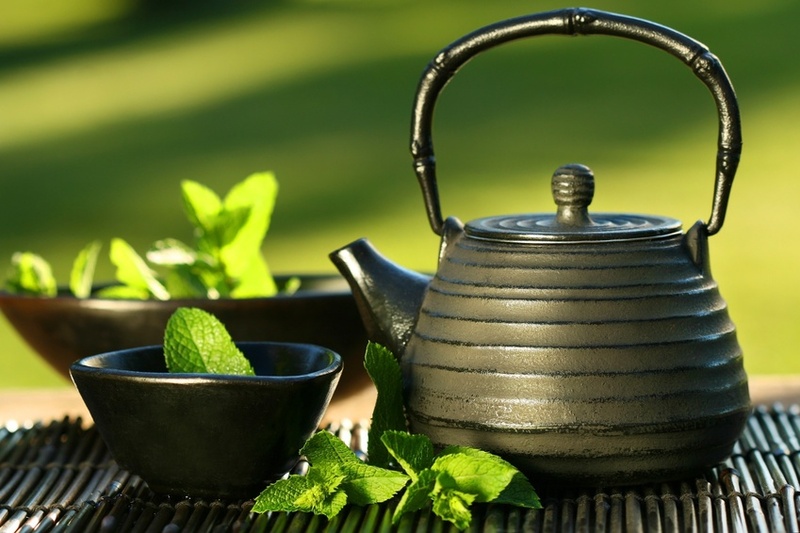 I drink Casino The Vert (green tea) after every meal because I’ve read from magazines that it is fat burning. 😀 Otherwise, I drink Marks&Spencer Pure Origin Kenyan Tea. I find it smooth and bold, perfect for a lazy afternoon at the office. Outside, when I see Coffee Bean and Tea Leaf, I usually order their chai tea which I like to mix with milk, or their genmaicha which I like for its nuttiness. When I want something different, more fragrant, I get their Japanese Cherry. It does, we enjoy all fragrant pleasures it seems! I really like the sound of the Japanese Cherry especially. I’m always on the hunt for new and intriguing teas so I will make sure to try the Coffee Bean and Tea Leaf ones, as well as the M&S one. Hahaha, I never expected to be writing about tea on a perfume blog, anyhow, I only drink ‘normal’ tea otherwise known as builders tea, not too strong though (I do not need to stand a teaspoon up in it) my favourite by far is the Twinnings breakfast tea. The BF got into the different teas whilst on a health kick and out of all the ones he tried, his favourite was the teapigs licquorice and peppermint (although he had to drink it away from me as the smell of the rooty licquorice made me gag). Nowt wrong with a bit of builders tea, it’s perhaps a little bit robust for my tastes, but then again I am a bit of a wimp. We have a lady at work who brews hers for so long and so strong I don’t know how she drinks it! It’s funny you mention the Liquorice and Peppermint causing that kind of reaction, my colleagues at work reacted in the exact same way. Really enjoyed this article, it was a nice yet relevant distraction from your usual perfume articles. I like tea. It took me a long time to appriciate tea and I almost had to force myself to like it. Starting with peppermint tea initially I ventured into the Earl Greys, Honey and Lemon, Rose etc and now can’t get enough. I will still never get tea with milk though, makes me feel queezy just thinking about it! You definitely have had a tea epiphany over the last year or so. What is your favourite? Oh and tea with milk RULES! What a British topic! Love that! I always drink tea, no coffee at all. I love peppermint tea and Jasmine tea. There is a company called Harney&Sons who make an excellent Jasmine tea. But a good cup of Earl Grey with lemon and sugar (no milk for me, I’m with Nigel here) in the morning is perfect on most days. It is a very British topic indeed! Jasmine tea is one I’ve tried to love but haven’t found one that I could really enjoy yet. I shall make sure to try the Harney&Sons one. I forgot about the Jo Malone tea collection, that’s the best thing they’ve ever done! Loved this post! I was advised to give up black tea 5 years ago after developing duodenal ulcers but unfortunately I really dislike herbal teas. I switched to Red Bush Tea which is really pretty unpleasant unless it’s with lots of sugar. Recently I’ve been trying to find my perfect black tea so I can have just one in the evening, but now I’m thinking I need a tea wardrobe like you and not just a “signature tea”! . Lapsang Suchong was strong and smoky but I got to like it. Darjeeling is too strong and going to try Assam next. However, I really now think I need to be more adventureous like you. Thanks for the inspiration. I like your “pretty tea” and that you have a Le Crueset mug. Very classy. Oh and I loved that you like florals in your tea as well! Sorry to hear about your ulcers Tara. It sounds like it has been quite tricky to find a tea that you are OK to drink but also tastes nice. Lapsang Suchong is nice, but I find it’s one you really need to be in the mood for. It’s good for adding a smoky flavour to food though! Teapigs might have something that appeals to you, they have lots of lovely flavoured green and herbal teas. I swear by my Le Crueset mug, it’s huge! I am an inveterate tea drinker, by which I mean that except in high summer, or when I am driving a long distance and think to bring an emergency bottle of water with me, the only two fluids to pass my lips are tea and alcohol. Okay, the alcohol might take various forms, but it sounds as though I drink less if I keep it generic! I have owned that Miller Harris one you mention, and also have a tin of Kusmi English Breakfast which is at its best before date now and starting to get a bit tanniny. Problem is, I am even lazier than you, clearly, because I can rarely be bothered to make a pot of loose tea, which some luxury blends only come in, so they just don’t get used up quickly enough. Everyday tea for me is Twinings Everyday in the yellow box, and I keep Fortnum & Mason Earl Grey and Twinings Earl Grey in stock for a friend who only drinks EG, together with a selection of randomly acquired “wacky teabags” as I call them of the herbal or healthy variety. I recently came across a very cleverly marketed Austrian brand of tea called Sonnentor, with which Birgit may be familiar. It had the most precisely specified tea blends / tea drinking scenarios – very whimsical as well as health-conscious. Me, I don’t really like herbal tea, sadly, though I can down a pot of jasmine tea in a Chinese restaurant as well as the next man. Confession time – the aspirational yellow Twinings tea has to be on offer to go in the basket. Currently getting through some Asda vaguely premium English Breakfast bags and a cast off box of PG Tips from Mrs Bonkers Senior! Is there a taste difference between the Twinings and the Asda/PG Tips. I’ve always wondered? We used to sell tea at work, and I remember being fascinated by the fact that major tea companies will hire a blender whose sole job is to ensure that every single teabag tastes the same, always! It’s quite like perfume in a way; the variations in crop quality and flavour means that different blends need to be combined to ensure that us difficult British tea drinkers always get the same tasting tea. Loose tea is definitely very fiddly, and there’s nothing worse than when some of the leaves escape from the weird-spoon-sieve-like-contraption-thing and into the tea. Fail! It’s funny that mention wacky teabags, Nigel and I had a clear out of the tea cupboard and removed all of the odd fruit and herbal varieties that were squatting. It’s very easy to by tea on a whim it seems. I really enjoyed the Twinings limited editions. I’m down to my last few Orange Blossoms now, but their rose tea won it for me. The Royal Wedding special was also delicious. However, my favourite tea will always be lapsing souchong. So beautifully smokey and intense, it’s like drinking a whiskey and cigar. I agree that the Twinings Rose Garden tea was lovely, it overtook another rose tea (namely Brewhaha’s) as my favourite rose tea to be drank with milk. I never got to try the Royal Wedding blend, it was a white earl grey I believe? Twinings still have it on their website so I should check it out. You make lapsang soughing sound so good – “like drinking a whiskey and cigar” is a perfect description. I enjoy lapsang but it’s a tea I really need to be in the mood for. I love tea. I drink coffee too, but I drink much more tea than coffee. The best teas I have tried so far are Twinings Irish breakfast, British breakfast, and Earl Grey; and PG Tips. I drink tea all day every day all year. My favorite is Twinings Irish breakfast, though I have been mainly drinking PG Tips lately. I’ll get back to Twinings soon. The only tea you mentioned that I have tried is the original Twinings Earl Grey, which I liked a lot. I usually go with tea bags and mostly drink it black. I’m glad to hear that you also enjoy Twinings tea! Although I do find their new ‘The Earl Grey’ to be an improvement on the original. How does the Irish Breakfast Team differ from the English? Do let me know what you think of The Earl Grey when you get to try it. It’ll be interesting to see what a fan of the original thinks, there was an outcry over here when they changed it! The Irish Breakfast tea sounds interesting, I would try it but breakfast tea hasn’t ever been my thing. Alright. I’ll be sure and let you know my thoughts. My love for tea started when I had some study holidays in UK when I was a girl and has hugely developed since! Now I’m settled on loose leaves tea, which I brew only in the afternoon when I have plenty of time (as I’m Italian, I drink also lots of espresso coffee, especially for breakfast) in my coloured teapots with inner filter. I use a timer and I like my tea not too strong. I drink black tea (mostly Chinese, Yunnan being one of my favourite), green tea (my preference again going to Chinese teas), and Oolong teas. No sugar, nor lemon, nor milk (I loved it, but I became slightly intolerant). I also love naturally flavoured teas, like Osmanthus oolong tea, Jasmine green tea, or Japanese Genmaicha. I sometimes drink also herbal teas (and I love some English brands’ package design!). My love for tea is closely related to my love for perfumes: loose leaves have a great variety of scents, depending on the origin and the degree of fermentation. Breathing deeply from a tea jar is, for me, even better than drinking the brew! It sounds like your tea ritual is very precise yet very calm! Osmanthus Oolong sounds fabulous! How have I never tried it?! I agree that tea and perfume are closely related. One of my favourite smells is the smell of Earl Grey tea leaves. At work in the hospital I drink lots of coffee, but at home it’s only tea! I drink all kinds really (black, green, roiboos, herbal). I use loose tea leaves, I like the taste better, but I have a very handy contraption that never lets any leaves escape into the tea! Favorites are the Kusmi teas, especially the Chai and Prince Vladimir. Earl Grey is never wrong, I associate it with my father who must have his cup of it every evening without fail! And no milk or sugar! I need one of those handy contraptions! You seem to enjoy some great teas, I will make sure to check out the Kusmi teas. It seems that most people are no tea and no sugar too. I am a builders tea girl. Just a spot of milk please. My favourite mug is celebrates the 101 Dalmations, and is a little worn. The best breakfast tea in the world by a country mile is Barry’s Gold Blend Irish Breakfast Tea. Do try it if you get a chance. I also love real Indian masala chai, not the starbucks nonsense. Strangely, for a budding perfumista, I cannot abide Earl Gray. Or any fruity or floral teas with the exception of peppermint. Your 101 Dalmations mug sounds very loved! Indian Masala Chai is pretty awesome, I’m with you there. That is unusual that you don’t like Earl Grey, as a perfumista. But it is definitely a love it or hate it kind of tea. Karak is a very popular tea here in the UAE and neighboring countries. Karak basically means cooked tea. We enjoy 2 parts saffron, 2 parts cardamom and 1 part clove. Then let boil for a good 8 minutes. It should not be watery nor should it be too creamy. Just enough texture to differentiate it from regular tea with milk. If you are able to, pour from the pot to the glass or cup from a height so that its partially frothed (aerated) which give it the extra nice texture. A tip to get the most out of the saffron is to let the saffron infuse in 5ml of scorching hot water for a few minutes. Then pour this into the cooking tea , milk and other spices. Reason is saffron requires either a lot of time or a lot of heat to infuse fully.